Neptune messina is an exciting new annual pasture legume for winter-wet saltland areas of southern Australia with ≥ 375 millimetres (mm) annual rainfall and soil pH(Ca) ≥ 5.5. It has higher combined tolerance to salinity and waterlogging than all other current pasture legumes. It can be safely used for grazing and will supply nitrogen (N) to soils that are generally highly N-deficient, provided it is inoculated with a specially developed salt-tolerant Rhizobium strain for messina. Messina (Melilotus siculus) is an aerial-seeding annual legume native to the Mediterranean basin that grows on saline, waterlogged soils up to 0.8 metres (m) tall. Until 2003 it was a little-known species, but was identified in trials conducted by the Department of Agriculture and Food, Western Australia (DAFWA, now the Department of Primary Industries and Regional Development) and the South Australian Research and Development Institute (SARDI), as part of the Future Farm Industries CRC, as the only pasture legume able to persist on severely saline, waterlogged soils. Neptune was subsequently selected as the most productive and persistent variety of messina. It is derived from a wild plant collected in Israel, and is adapted to winter-waterlogged areas where topsoil (0–10 centimetres) salinity levels in summer-early autumn are 8–30 deciSiemens (dS)/m ECe (moderate-severe). Its main identifying features are shown in Figure 1.
soil texture from sands to heavy clays. Neptune has higher salt tolerance at germination than all other currently available pasture legumes. It had 99% germination in a 300 mM NaCl concentration (~55% sea water concentration), compared to 65% for Scimitar burr medic, 27% for Jota white melilot and 12% for Frontier balansa clover. This is critical for saline soils in southern Australia, as topsoil salinity levels are highest over the summer-autumn period, when germinating rains occur. Messina plants are more salt tolerant than all other current pasture legumes. In one study by the University of Western Australia (UWA) messina continued growth and new leaf production after 14 days treatment in a 550 mM NaCl solution (seawater concentration). Glasshouse studies by UWA have confirmed messina has similar waterlogging tolerance to balansa clover. Neptune starts flowering around 98 days in Perth from an early June sowing, three days later than Frontier balansa clover. Neptune is moderately hardseeded. An experiment in Perth showed 26% of Neptune seeds remained hard in June, compared to 42% for Scimitar burr medic and 6% for Frontier balansa clover. This will ensure good germination levels in the year after sowing, while keeping seed in reserve for germination in future years. Its delayed seed softening gives greater tolerance of false breaks and defers germination until rainfall is more likely to flush salts from the soil surface. Neptune messina was the most productive and persistent of 21 varieties over three years on saline, waterlogged soils at Darkan and Tambellup in WA and three sites in the Keith district of South Australia (SA). It produced more biomass across the five sites than Frontier balansa clover, Scimitar burr medic and Jota white melilot, currently the three best pasture legumes for saline land. At the two WA sites total dry matter yield of Frontier, Scimitar and Jota over three years was only 17%, 16% and 3%, respectively, of Neptune messina (Figure 2), which had a highest annual plot measurement at Darkan of 7.6 tonnes/hectare (t/ha). Data from SARDI showed green plants of Neptune have high nutritive value, with 82% digestibility, 28% crude protein, 31% neutral detergent fibre and 13 megajoules per kilogram (MJ/kg) of dry matter (DM) metabolisable energy and no known toxic chemicals. A sheep grazing trial in SA showed pure Neptune poses no threat to livestock health and produces meat acceptable to consumers (Figure 4). However, Neptune was less palatable than sub clover and lower liveweight gains were achieved, but other observations indicate it is readily grazed when other species are also present. Neptune is, therefore, recommended for use in mixed pastures. 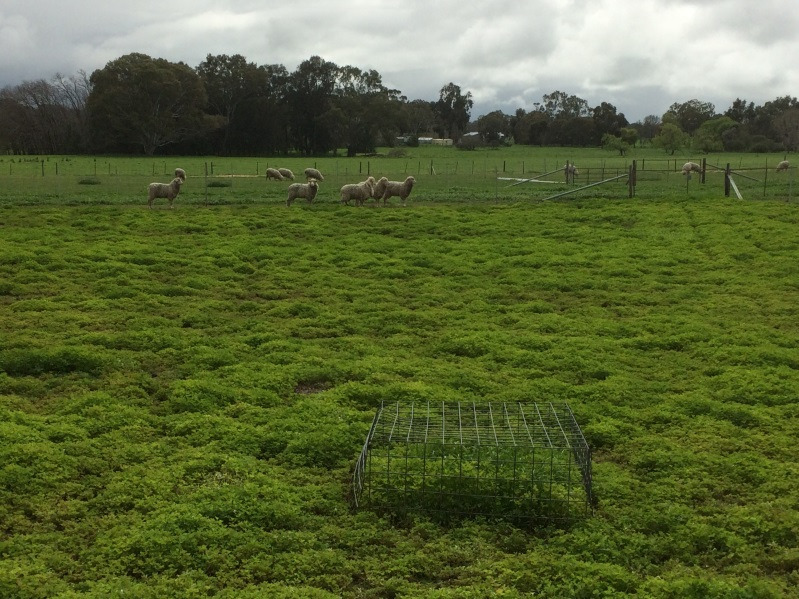 The inherent variability of saline paddocks for levels of both salinity and waterlogging will result in Neptune and other pasture components occupying different niches within a pasture. Neptune messina will be grown on soils unlikely to contain any suitable rhizobia and must be inoculated with the special salt-tolerant messina Rhizobium (strain SRDI554). Other strains of rhizobia will not survive over the summer in the saline topsoil. Seed should be inoculated with a peat slurry, lime pelleted and sown promptly (ideally within 24 hours) after inoculation. Seed fungicides can be applied before inoculation with rhizobia to prevent damage from root rot pathogens. Sow into moist soil in autumn or early winter. Ideal timing is to delay sowing until early rains have flushed salts from the surface, but before waterlogging occurs. Recommended sowing rate is 10kg/ha. Sowing depth should be 10-15mm deep, similar to subterranean clover (which has a similar seed size). Sow into a well prepared seed bed following good weed control. Apply adequate rates of fertiliser to ensure phosphorous, potassium and other trace elements do not limit production. Saltland environments are highly heterogeneous for salinity and waterlogging potential. Species mixtures are recommended to enable different plants to colonise parts of the landscape where messina is less suited and to provide a more balanced feed intake. Neptune can be mixed with other pasture legumes, including balansa clover, burr medic and white melilot and with the perennial grasses, puccinellia and tall wheatgrass. It can also be sown as an understorey species with saltbushes. The paddock should be weed free prior to sowing. No chemicals are currently registered for use on messina and herbicide testing has been limited. Messina should be monitored for redlegged earth mites and aphids during emergence and later in the season and controlled as required. Native bud-worm (Heliothis) can invade developing seed pods and seed production may be reduced if this pest is not controlled. Neptune has some susceptibility to powdery mildew. Neptune is available to farmers through Seednet, which has the licence to produce and market Neptune.